Welcome to Singapore! Hitachi Asia Ltd. has has been hard at work on the $78 million (J¥5.4 billion) "Sentosa Express" monorail. Thanks to Yoshitaka Hirabaya of Hitachi, we are pleased to bring you the first pictures of this beautiful monorail. Even though the system is not open yet, landscaping is already quite extensive. 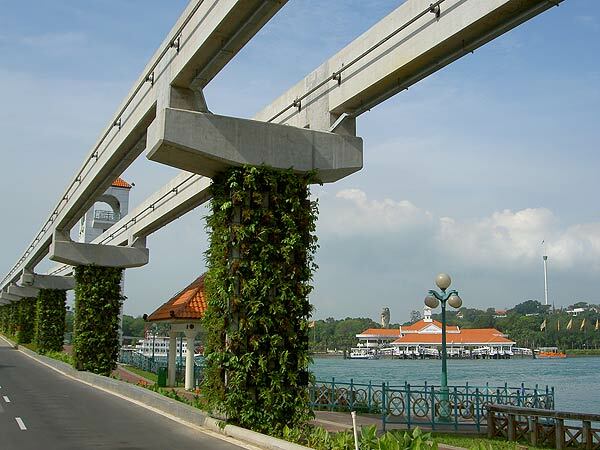 Nothing like real greenery to make a monorail pylon look pretty! The 2.1 km long double track line will link the main island of Singapore and Sentosa Island, with gateway stations at World Trade Centre's Harbour Front MRT Station and Central Beach on Sentosa. 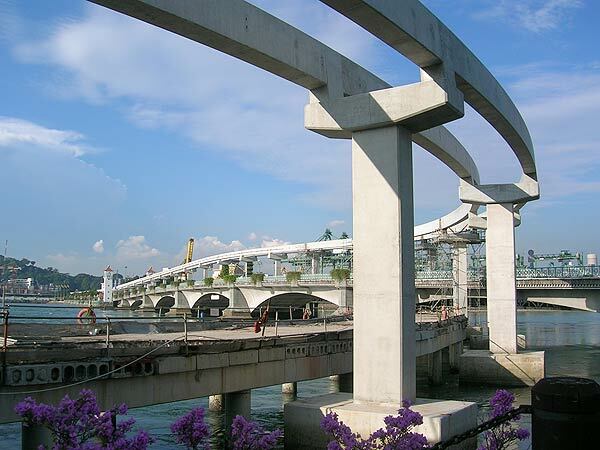 The line will improve access to Sentosa Island from the southernmost tip of Singapore. The monorail route will have four stations. 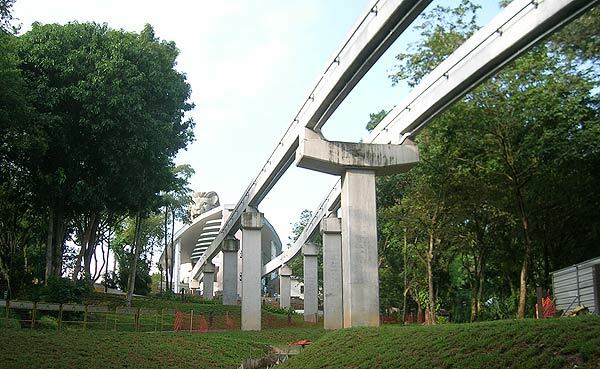 The Sentosa Express will be the first in the world to use the new Hitachi Small monorail system. The system was originally developed by Hitachi in Japan as a small, standard and cost-effective solution to the transportation needs of small to medium-sized cities. 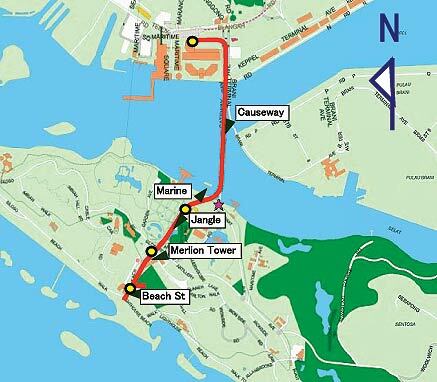 The monorail replaces an old Von Roll monorail that circled the island from 1981 to March of 2005 (light gray line that loops the island on this map). The black triangles indicate where photographs were taken for this page. Hitachi's new flat-sided guideway is slightly wider than that of the track at Walt Disney World and Las Vegas Monorail. See our Alweg Beam Comparison Chart for a comparison of track sizes. This stretch of track will undoubtedly be one of the most photographed sections, as it crosses the beautiful Causeway Bridge to Sentosa Island. 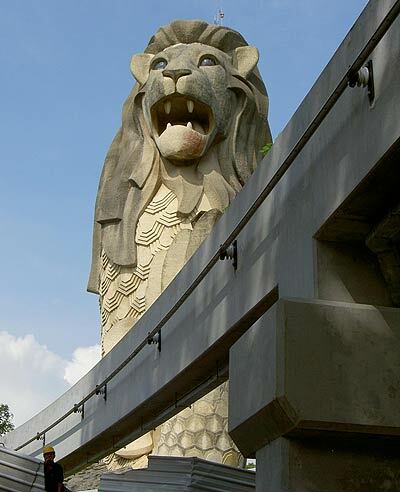 This station is located half way across the island next to a large lion statue known as The Merlion. Monorail riders will be under the watchful eye of The Merlion.